a. Retail rates are non-commissionable. Attention Advertising Agencies: our rates our non-commissionable. We do not offer contracts, repeat discounts, quick pay discounts, cash discounts or pre-pay discounts. b. Advertising is payable at the time of purchase unless the advertiser or his agency has credit with paper, or until credit is established. Payment in advance is required for all new advertisers until credit is established by check , cash or money order. We do not have a credit card machine, no credit cards accepted. c. “Going Out of Business” advertising is accepted only with payment in advance. d. Payment in advance (by check only) is required for all political ads. e. Account Terms — Net 15 days. a. Rate Revisions: Publisher reserves the right to revise rates at any time on at least 30 days notice. Available on specific pages including a back page premium and a Banner ad on B1. * Minimum display ad is 1 column inch x 2 inches. A 2 column ad must be a minimum of 2 inches in height, 3 column ads must be at least 3 inches in height, etc. 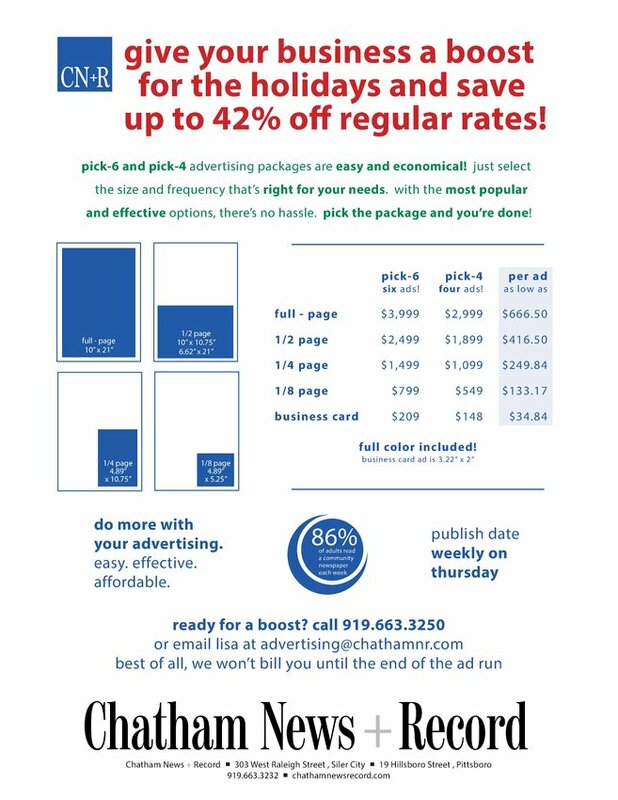 The Chatham News and The Chatham Record offer low-cost delivery of pre printed material to most Chatham County homes. All inserts sized 6 standard/12 tab pages are billed at a flat rate of $550.00 regardless of the number of preprints. Inserts larger than 6 standard pages are billed at a flat rate of $575.00. Inserts may be placed in both The Chatham News / The Chatham Record for these rates. ZONING NOT AVAILABLE. All preprinted inserts are to be delivered to the Greensboro News & Record, 200 East Market Street, Greensboro, NC 27401. Delivery must be made 10 days prior to publication. Receiving hours are 8:00am – 4:00 pm, Monday through Friday. Some holidays will require early delivery of materials. All delivery and shipment costs are to be pre-paid. Skids should carry identification, to include name of advertiser, date of insertions, total copies per skid, total number of copies shipped. *** Pre-prints must be received and scheduled at least 10 business days prior to publication date. Maximum insert size – 10” x 11” (folded) larger must be quarterfolded. Minimum size accepted 5” x 7”. a. Proofs are available on all display ads, either by email, fax, mail or in our office. Proofs will be delivered (locally) if requested for 1/4 page ads or larger. Approval of proofs with any errors will be the responsibility of the client. c. Tear sheets will be provided if requested for all display ads. d. Advertising layout service provided to advertisers. e. Clip art services, including cuts and illustrations, are available for ads at no charge to advertiser. f. Included in our reasonable rates is personal attention to your advertising needs, including advice and consultation about your advertising program. Feel free to call on us for help. If an ad is submitted electronically, it must be on a CD or flash drive that is PC compatible. PDF (preferred), JPEG or TIFF. Power Point, Excel or Mac computers. a. All advertising copy is subject to acceptance by the Publisher, who reserves the right to revise, edit or refuse any or all copy. b. We reserve the right to insert the word “advertisement: in all ads, especially “all copy” ads which may be mistaken for news articles. c. We want your ad to be accurate and correct, and normally there will be no errors. However, should there be an error and it is our fault, we will give you a correction letter and a discount which is deemed appropriate by the management for the space occupied by the incorrect copy. However, we must be notified in time to correct the advertisement before the second insertion. Credit is allowable for the first insertion only. In the event of error or omission we will, upon request, furnish a letter stating the correction, but will not assume any liability for any difference if goods are sold at the incorrect price nor is the advertiser required to sell the product or service for the incorrect price. The Chatham News Publishing Co., Inc. will not be held liable for any loss due to omission of advertising material. d. The advertiser agrees to indemnify and save harmless the publisher against any and all loss, damage, cost and expense which the publisher may incur or become liable for by reason of any and all claims or actions for libel, violation of right of privacy, plagiarism, copyright infringement, and any and all other claims in connection with advertising matter published pursuant to the terms and provisions of the contract, including without limitation the expense and cost of defending any and all such claims and actions. e. Due to production limitations we do not guarantee positions, nor is advertising accepted for publication subject to position. Failure to comply with a position request will not result in a “make good” or refund. f. POLITICAL AD POLICY All political ads must be placed in the Siler City office located at 303 W. Raleigh St., Siler City, NC 27344. No payment or placement will be accepted in the Pittsboro office, All ads must be paid for at the time of placement or by Thursday week prior to publication at 5:00pm in advance of publication. Political ads can not be placed on account, payment by check only. No ad is accepted for publication until paid, including emailed ads. The ad must be paid for by Thursday 5:00pm week prior to publication in the Siler City office. All ad copy must be submitted by deadline Thursday week prior at 5:00pm. An ad that opposes a particular candidate must disclose the candidate it is intended to benefit and whether the ad is authorized or not authorized by the candidate. These disclosures must be at least 5% of the height of the printed space and be at least 12 point in size no matter how small the ad is. Includes birthdays, anniversaries, memorials, church news, etc. **For proofs, color ads, multiple pages, double trucks, large ads, or extensive layout work, above deadlines advance 24 hours. a. Standard page size is 9.889” wide x21” deep, (6 columns x 21”) or 129 column inches per page. Double Truck 13 columns x 21” billed at 279 inches. b. Width of column is 1.56”. Columns to page is 6.
a. Classified Display Open Rate $7.25 Classified section on 6 column format, same mechanical measurements as the rest of the newspaper. • A cost of $5.00 per insertion for 25 words or less. Additional words are 20¢ each. • Non-business classifieds must be paid in advance, unless an account is established. • “Keyed or Blind” Ads that are mailed to our post office box cost an additional $5.00. No information will be given from this office as to the identity of persons placing blind ads. **These directory ads must run a minimum of 4 weeks with no changes. The Chatham News and The Chatham Record are published weekly, by The Chatham News Publishing Co., Inc. at 303 West Raleigh Street, Siler City, NC 27344. Can link to either your homepage or a printable PDF of your ad.